The word ‘equinox’ is derived from the Latin words aequus (equal) and nox (night), and after the Summer months, this time of year is for finding more balance in life (especially if any of us ‘over did it’ in the Summer). Autumn is also characterised very much by wind, the life cycle of plants, unpredictable weather, and the changing of our habits as we perhaps adopt a different approach (consciously or subconsciously) to this time of year. All of these aspects are very much linked to the Ayurvedic dosha of Vata, which in itself is all about movement, change, and coolness. (To find out more about Ayurveda, the doshas and Vata, click HERE). We might notice this aspect of Vata becoming more apparent at this time of year – especially if you yourself are a Vata-type dosha. Feeling ‘ungrounded’ or anxious, needing warmer foods and drinks, feeling the cold a little more, noticing drier skin on the hands, elbows, knees and legs, cracking or ‘popping’ joints, becoming more easily tired, and getting easily thrown ‘out of balance’ are all strong characteristics of an excess of Vata. In order to find balance with this dosha, it’s important to eat grounding, warm and nourishing meals with more fats and protein, develop daily routines, and to make meditation a priority. Slowing down and building strength are also important – just as important as making time for rest and comfort. Specific spices to balance or ‘ground’ Vata are cinnamon, ginger, cardamom, star anise, turmeric, ashwagandha and licorice. Kitchari is a fantastic dish to make at this time of year too I’ll post a recipe for this next week), since its extremely nourishing, warming, comforting, healthy and is often used when detoxing as it contains such beneficial ingredients and gives the digestive system a slight rest (very good if you’ve spent most of Summer drinking too much alcohol or eating only hard-to-digest raw foods). 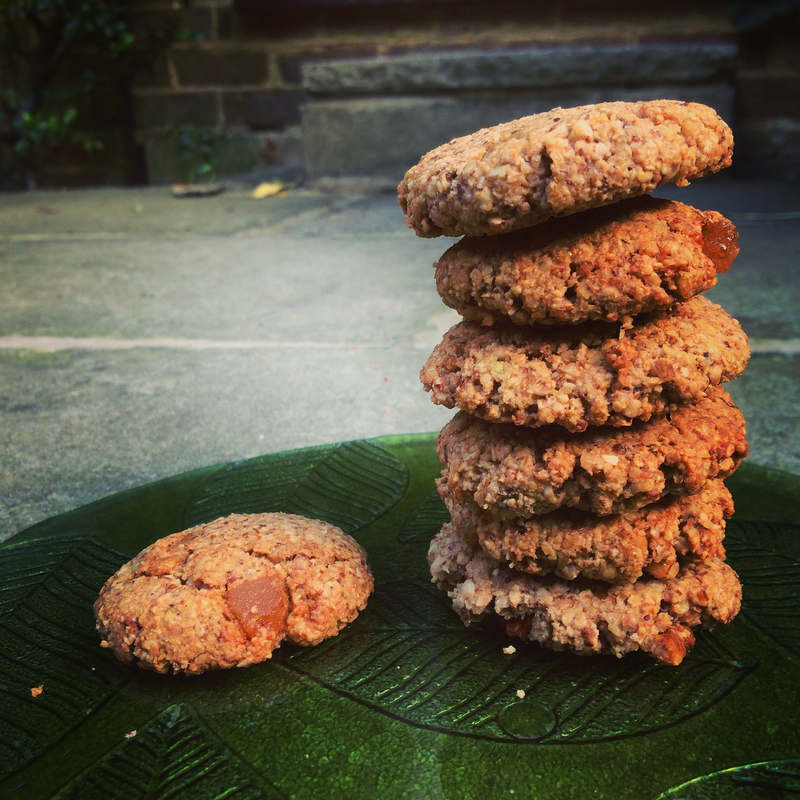 Due to all of the above then, it seemed like the perfect excuse to make some of these walnut, maple and ginger cookies….. Healthy fats from walnuts, grounding ginger, natural maple sweetness and calming oats make this the perfect Vata balancing snack. Make up a batch of these when you’re in need of balance (or in need of cookies), and dip them in tea to make the whole thing extra comforting. This is the perfect “into fall” recipe. I love anything maple flavored!